Picnic Beetles (Nitidulid spp.) are very common beetles that are attracted to tree wounds. If someone prunes or cuts an oak tree while during the beetle's life cycle (April-July), the beetle is likely to spread fungal spores from infected trees to healthy trees with wounds. Oak Trees have very large root systems. It is very common for oak trees to graft roots with other trees- this essentially means that the roots from one tree will "fuse" with the roots from another tree. 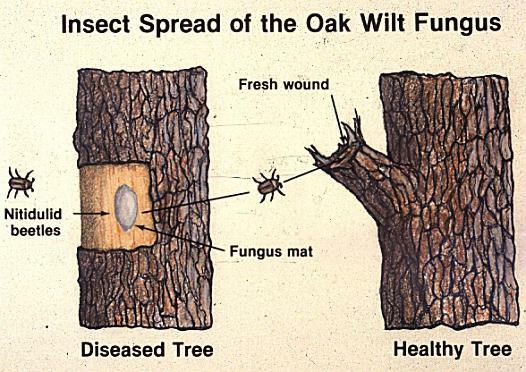 When an oak becomes infected with oak wilt, the fungus can move very quickly through root grafts to surrounding trees. The most characteristic trait of oak wilt is rapid leaf drop. Leaves begin to wilt, turning a brownish-red color, then rapidly fall off the tree. 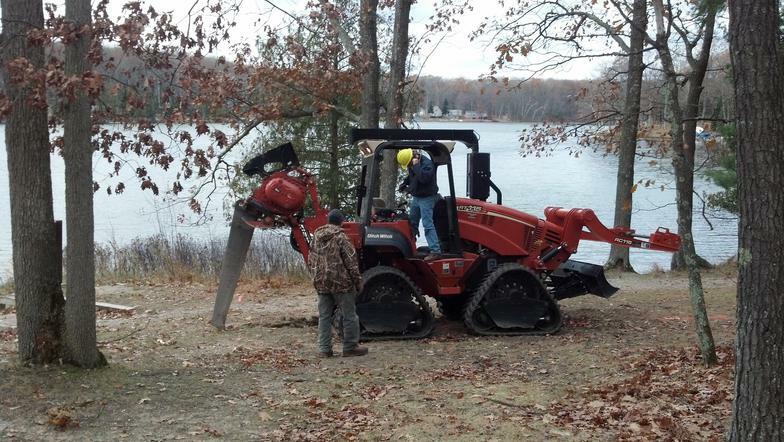 Landowners will notice that every single leaf on their oak tree will fall off. From the time of initial leaf drop to the time dies, it is usually only a 1-2 week period. Usually you will also notice pocket mortality- multiple trees all dying within a relatively short period of time. If your tree is still alive, but expressing the rapid leaf drop and wilting, a sample can be taken and sent to MSU Extension by overnight mail to diagnose whether the tree has oak wilt. Another very common way to identify oak wilt is what we call "pocket mortality." Pocket mortality basically means a group of trees all in a single area that are dead or dying. After the tree has been dead a year, fungal spore mats will begin to form underneath the bark of the dead oak tree. Look for fissures in the bark. A simple test is to stand at the base of the tree and lightly tap the bark in many places with the back of a hatchet or axe, trying to listen for hollow spots. If you hear a hollow spot, you can cut back the bark. If you see a black mat like the one above, your tree may have had oak wilt. Try to get close to the mat and take a sniff. If the smell is similar to juicy fruit gum, mead, or cider vinegar, you likely have an oak wilt fungal pad on the tree. The fungal pad produces spores, which can be spread to other trees. to healthy trees are an option for landowners with a few valued trees in their yard. Trunk injections require a chemical fungicide that combats oak wilt to be injected into the trunk or roots of the tree. On a small scale for a few trees, this is a feasible option; however, on a landscape scale (multiple acres of land), this option is not feasible as it can be very cost-prohibitive. DO NOT CUT OR PRUNE FROM APRIL-JULY!!! Picnic Beetles move very fast to tree wounds such as cuts or prunes. From the time a tree is cut/pruned to the time the picnic beetle can move to the tree, it is only a few short hours. Therefore, it is imperative that you DO NOT CUT OR PRUNE FROM APRIL-JULY!!! If you absolutely must, make sure that you IMMEDIATELY cover the wound with some kind of sealant such as an outdoor, water-based latex paint to keep the beetles out. you must wait for the threat of picnic beetles to be gone before you can begin treating the area. Once trees are infected, the only way to prevent the spread is to sever the root systems of healthy and at-risk trees from the infected trees. 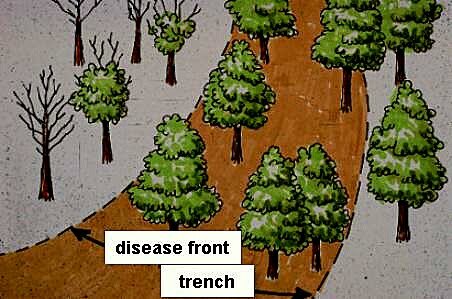 This is done by digging a trench line 3-5' deep (90% of tree roots are within the first 3 feet of soil). A trench can be done with a vibratory plow (to the right) or backhoe. There is a very specific set of guidelines for putting a trench line in the correct spot. Therefore, please contact a professional, such as your local conservation district forester, to form the line.